Drowning in toys? 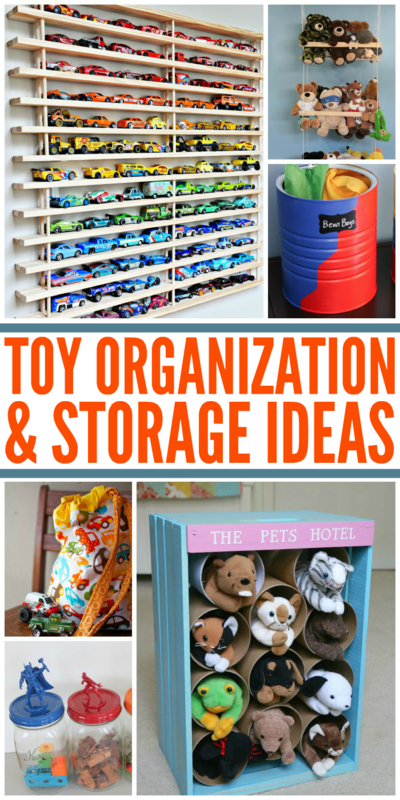 Here are 20 toy organization and storage ideas to save your sanity – there are also ideas even when space is non existent. After my son has played for a couple of hours, it looks like a toy bomb has gone off. Puzzles, magnets, cars, trains and stuffed animals are scattered across the floor or stuffed haphazardly in a box (or three). It’s not a good system. 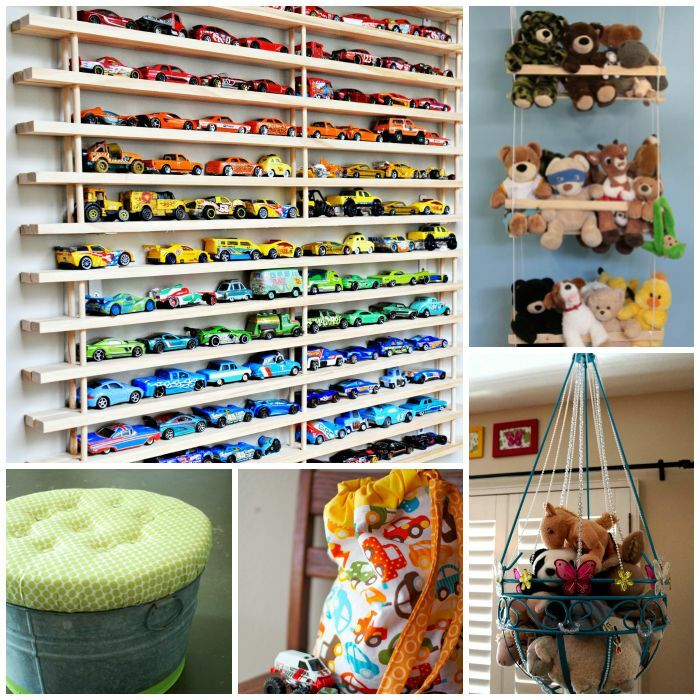 For inspiration, we’ve found 20 SMART toy storage solutions that you can make yourself. Some of them are seriously easy and seriously cheap. Check them out! Always stepping on Legos? Keep them off the floor with this genius Lego pick up and play mat. Super hero toy storage jars are the ideal place to store small items like toy soldiers, bouncy balls and art supplies. Make your own clear toy storage bags so you kids can easily see what’s inside without dumping out all the contents. Peg boards can be used for more than tools. Hang your kiddo’s cars, trucks and construction toys on one! Even babies have lots of toys. 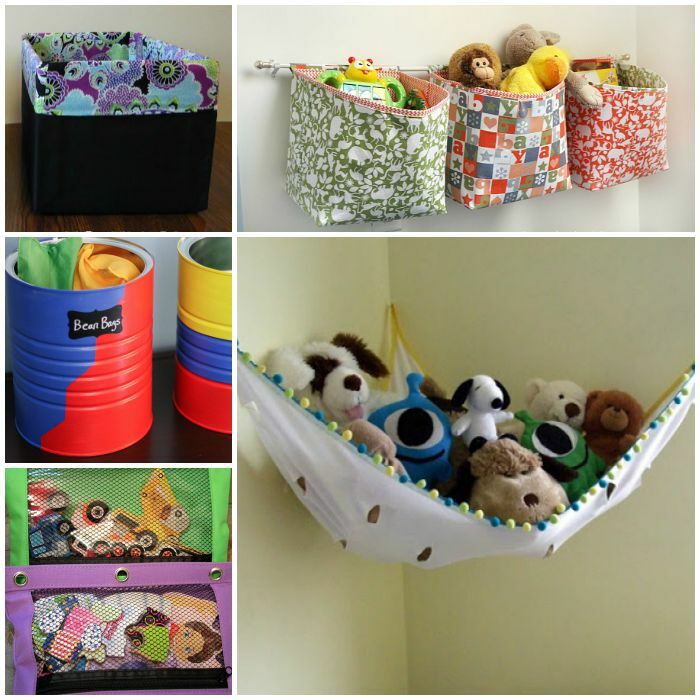 A playpen bag can be so helpful for storing those stuffed toys and rattles. Upcycle old wipes containers with chalkboard paint to make new containers for small toys. Do you find magnets everywhere? Store magnets on painted pizza pans to keep them in their place! Turn a wooden crate and cardboard tubes into a toy pets hotel! This would be a fantastic way to store cars, too. 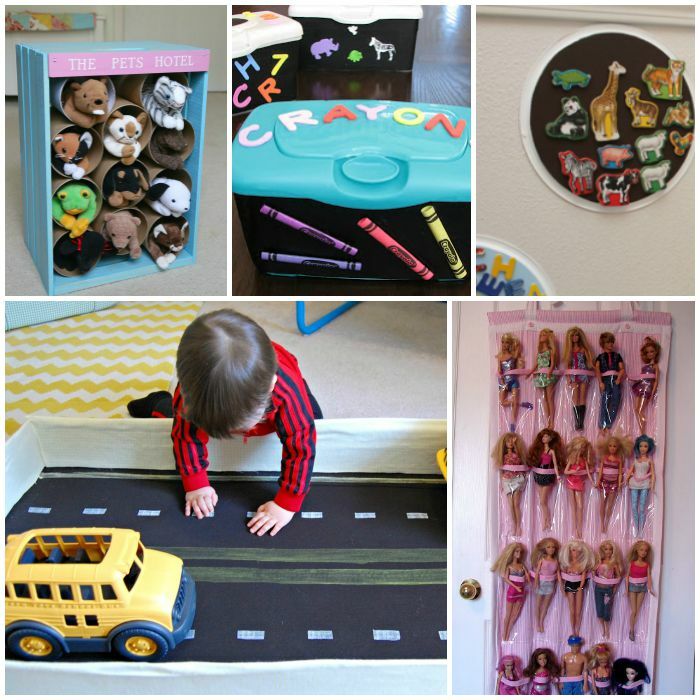 Make a fabulous toy car storage box that doubles as a play mat. Too cool! Make your own Barbie organizer if you’re crafty, but if you’re not, a shoe organizer will work in a pinch. The Anywhere Bag is a wonderful way to store toys in the car. We love this stuffed animal swing. It’ll look great even in an older kid’s room. Speaking of storing stuffed animals, try repurposing old plant hangers for them. What a pretty way to display toys! This upholstered bucket ottoman makes a gorgeous addition to a nursery. It serves as both seating and toy storage! How amazing is this Matchbox car garage? Not only does it keep those cars off the floor, but it’s a super cool way to decorate a room! Hanging fabric storage baskets are a beautiful addition to any room. 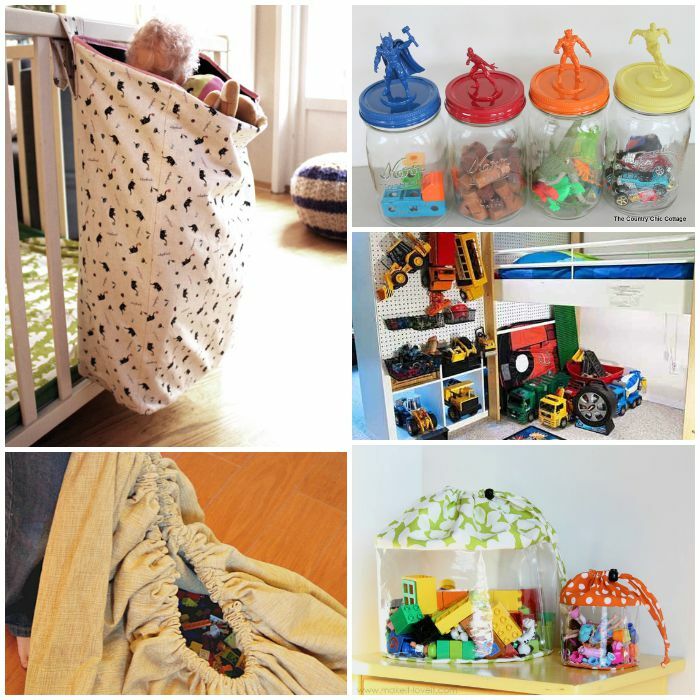 Use them to store lightweight toys in your kids’ room. Brightly painted coffee cans are just the right size for blocks, magnets, balls and beanbags. Make your own stuffed toy net, or use any old piece of fabric to make a hammock if you can’t sew. We’re always losing puzzle pieces. I only wish I had thought to store them in pencil pouches! You’ll be amazed to know that this toy box was made out of an old diaper box and some fabric. Frugal and easy! For even more terrific toy storage ideas, check out 26 Ways to Organize Toys in Small Spaces.